Click to open full infographic. A large body of Canadian and international research demonstrates the connection between school library programs and student success, and explores the specific factors that are associated with effective library programs. Current practice in education supports a teacher inquiry approach to action research to build a repertoire of effective instructional practices. Exemplary School Libraries in Ontario. A Study by Queen’s University & People for Education. Ontario Library Association, 2009. School Libraries and Student Achievement in Ontario. A Study by Queen’s University & People for Education. Ontario Library Association, 2006. Connecting British Columbia (Canada) School Libraries and Student Achievement: A Comparison of Higher and Lower Performing Schools with Similar Overall Funding. Ken Haycock. School Libraries Worldwide, 2011. Reading for Joy. People for Education, 2011. 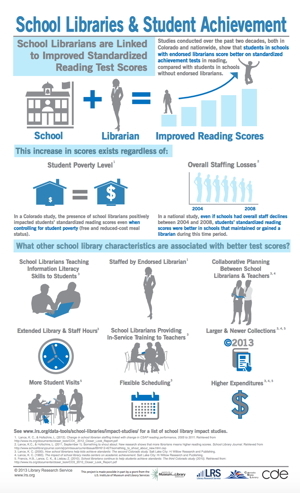 Library Research Service: School Library Impact Studies. A comprehensive list of American and international research into school library efficacy. Treasure Mountain Canada (TMC) is a bi-annual research symposium and think tank building collective knowledge about the library learning commons and school improvement. The collection of papers submitted to symposia in 2010, 2012, 2014 and 2016 present a treasure trove of action research into learning commons practice in Canada.